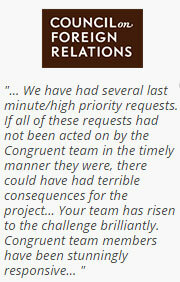 Congruent provides Dynamics CRM consulting and implementation services to customers worldwide. We have been helping customers to leverage the entire potential of Dynamics CRM with our expert consulting and implementation services, thereby enhancing their productivity and providing them a holistic view of their clients. Microsoft Dynamics CRM can be a very useful and powerful tool to boost your sales and client relationship. All that you need to leverage the entire potential of Dynamics CRM is to implement it the right way and with the right partner. Our team of highly experienced onsite CRM consultants along with our huge offshore development team could well be the right fit to achieve all your CRM objectives. Why Congruent as your Implementation partner? We would be happy to help you with any queries and requirements that you might have in Dynamics CRM implementation. Kindly write to us using the enquiry form to know more about our Dynamics CRM implementation service offerings and how we could be of help to you.